Vincent Vega might be a cold-blooded hit-man under the employ of Marsellus Wallace, but that doesn't mean he takes orders from just anyone. Just look at that hairstyle—it says a lot about the man! That's the kind of hair that only an outlaw wears. It's the kind of hair that lets a man know not to stick his nose into Vincent's business. It's the kind of hair that doesn't follow any man's rules. Even Marsellus wouldn't be able to get Vincent to change that hair and that's the kind of thing that you have to respect. Now, you can have that hairstyle with this licensed wig. 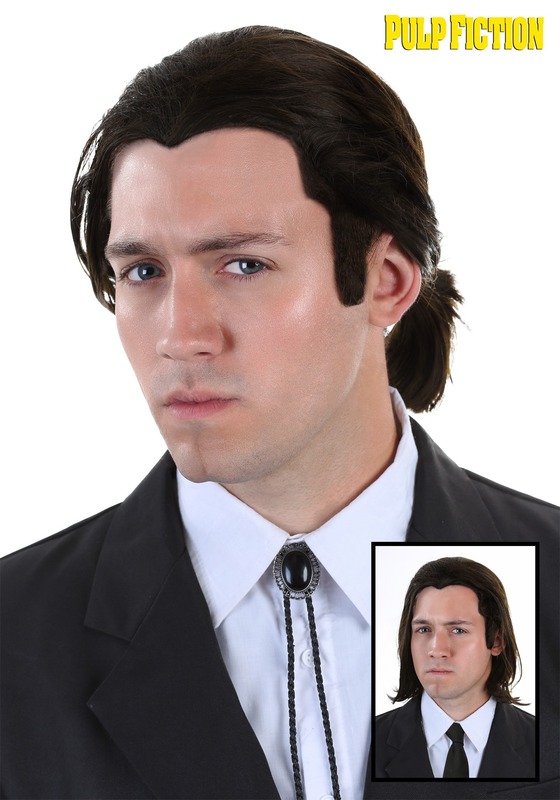 This Vincent Vega wig fully recreates the hairstyle worn by John Travolta in Quentin Tarantino's Pulp Fiction. The long, dark locks are made of synthetic fibers and it fits on your head with elastic. The hair can be pulled back into ponytail for classy dinner dates at Jack Rabbit Slim's, or you can let it all hang down during a dangerous hit. For added measure, this accessory kit comes with Vincent's signature bolo tie, since any true outlaw wears a bolo tie when he's tracking down Marsellus Wallace's missing goods. The pieces combine for a look that will have you feeling just like Mr. Vega! Just make sure to keep the safety on while waving around your hand cannon, since you don't want to have a repeat of what happened to Marvin. This wig looks nothing like the picture or even comes close to looking like the hair needed to resemble Vincent Vega!! It's awful! I will be sending this back for a refund...don't make the same mistake I did.